Witamy i Wesolych Swiat! (Greetings and Happy Holiday)As I approach my 64th Easter, the anticipation of my favorite traditional Polish foods has not wavered one bit! 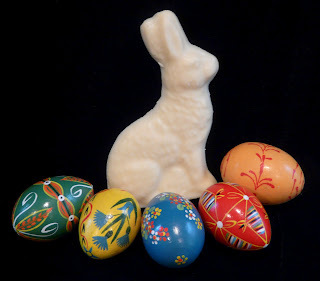 Easter is one of the two biggest culinary feasts of the year for most Poles. Curiously, my memories of Easter celebrations go back much farther than Christmas, even though as a child I usually associated Christmas with getting and giving gifts. But for some reason my lips get smacking more at Easter – perhaps because I have always enjoyed the traditional dishes so much. This past year we have been travelling up and down the east coast signing our book at many Polish church festivals. We often get big thanks from our new friends for including the heritage recipes in our book. About a week before Easter, my assignment always was and still is to dye a batch of hard boiled eggs – five colors with each fizzy tablet dissolved in a coffee mug cup of boiling water with a splash of vinegar. I keep dunking to get the brightest hue possible. After they dry we shine them up with a bit of cooking oil. Then there's the butter lamb. Most of the time we could buy one at a Polish deli and it rested in the freezer until the big day. It always sat on the table next to a chocolate rabbit, and when we got to dessert, I always had to bite off the head to see if it was hollow or solid. Getting the first bite into that rabbit was a morbid but delicious privilege. A few years ago Laura found a lamb mold and she has been making her own Easter lambs…but special care must be taken to fill the mold completely, otherwise we would end up with a deformed lamb – not a pretty sight. This year it'll be the white chocolate rabbit. A few of the traditions we followed when I was growing up have since become “Americanized” but we still exchange bits of hardboiled egg and exchange Easter wishes to each other – the same as we do at Christmas with a blessed wafer. Our menu hasn’t changed much from the early years...things get serious shortly after coming home from church and we're all hungry. After sharing the egg, we sit down and start with the clear Barszcz (page 29) which is served hot "on the side" in elegant china cups. The rest of dinner is served chilled or at room temperature. There’s always a ham, and several varieties of kielbasa (always from a Polish deli). and wasn’t looking, I would sneak in an extra tea spoon of horseradish, but somehow I always got caught because my eyes watered from the “kick”. Years ago back in Pittsburgh, my Mom always got our ham from the Polish market and I particularly remember that it was a lot leaner and had a milder flavor than American brands. It was absolutely not salty in the least. My Mom always said that Polish pigs were fed potatoes which gave them that milder flavor. I don’t know how true that was but it certainly sounded plausible. These days we go for a honey-glazed spiral sliced variety, just because it’s easier. Desserts included one or two Mazurkas, a Baba, and occasionally a Polish cheese cake. Our book contains recipes for most of the traditional foods, tested and adjusted for modern kitchen techniques. If you get a copy you’ll be all set. 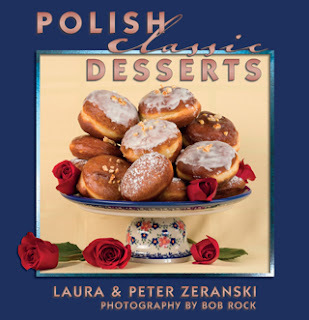 And our new book, Polish Classic Desserts, which we are working on right now, will have many of the classic Easter baked goods. Here is a Baba recipe that I particularly like because of the rum that flavors the icing. Remove the warm cake from the pan onto a serving plate and immediately pour the icing slowly over the top, letting it drip down the sides slightly. For a splash of color, sprinkle with bits of candied orange rind or orange zest. Cool thoroughly before cutting. Smacznego! Thank you! I'm preparing a Polish Easter feast, and I found this information quite helpful.